Oh, the wonderful SNES. This baby was a joy to play after the sucess of the NES system. It was a beautifully designed console and was as rugged as they come. No more of that blowing into the cartridge and jiggling around the cartridge to get the game started on this system. Most games console manufacturers employ some kind of regional protection to prevent games from being played in a region before its official release date. The most well known and widely used system is the DVD CSS protection and regional coding. US carts won't physically fit in the slot of Japanese or European consoles because of their rectangular shape. Japanese and European carts won't fit in a US SNES either, due to the two small tabs which correspond to grooves on the bottom of the cartridges. However, it is possible to remove these tabs. It is also possible to widen the cartridge slot on Japanese and European consoles. A similar system was also used on the Nintendo 64. Every SNES control deck has a regional lockout chip (known as a CIC), as does every original SNES game cartridge. Before a game is loaded, the console will attempt to communicate with the CIC chip on the game cartridge. If the CIC chip doesn't respond or does not correspond with the consoles CIC, the console won't load the game. In most cases, a black screen is displayed. Many later SNES games contain code to detect the frequency of the PPU (Picture Processing Unit). Since the PPU's in all PAL consoles operate at 50Hz, whilst NTSC (US and Japanese) models operate at 60Hz, this could be used to check if an NTSC game was being used on a PAL console, regardless of the region detected by the CIC chip. Many of these games display the message: "THIS GAME PAK IS NOT DESIGNED FOR YOUR SUPER FAMICOM OR SUPER NES." This was a response from Nintendo to the widespread use of universal adapters in Europe, which used the CIC chip from a PAL game to load an NTSC game. Since these universal adapters could not tamper with the PPU frequency, this rendered them useless with imports with this protection. Luckily, there are very few games with this protection. The only way to get round this protection is a modified console. 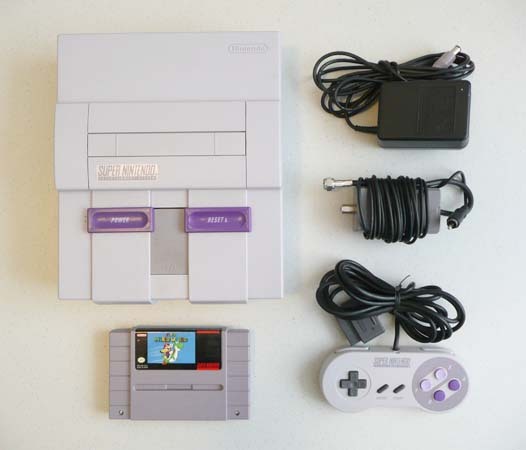 Later versions of the SNES output a lower voltage to the cartridge connector, presumably to hinder the operation of copier units and other third party devices which drew power from the console. Having said this, we have never come across a copier unit that did not work with any SNES model. One of the unique features of the SNES is the use of special chips in many of the game cartidges, used to enhance graphics and increase the processing power of the existing hardware. The DSP chip was used in a number of games to produce more realistic 3D effects, by carrying out some of the data processing on the cartridge itself. Games that use the DSP chip include Pilotwings, Super Air Diver and Super Mario Kart. There is also a DSP2 chip. The Super FX chip was used to create 3D polygon effects in games such as Star Wing (known as Star Fox in the US and Japan). The Super FX chip makes use of the twin 8-pin connectors on the game cartridges, which give the game direct access to certain aspects of the SNES' hardware including the PPU's. The Super FX2 chip is a faster version of the original FX chip and was used in games such as Doom, Dirt Trax FX and Stunt Race FX. The C4 chip is a graphics chip designed by Capcom to create the transparent visual effects in Mega Man X2/X3.